To participate in the BHG/Drake’s Rewards Card, the cardholder must be 21 years of age. All websites owned and email services affiliated with Bluegrass Hospitality Group use security measures to protect against the loss, misuse, and alteration of the information under our control. We work with select partners to store the information in a database in a secure environment at their data center. We will never share, sell, or rent individual personal information with anyone unless ordered by a court of law. Information submitted to the Bluegrass Hospitality Group through our websites, online services, online or in-store purchases and programs is only available to select employees or partners managing this information for purposes of updating your account, preferences, contacting you regarding BHG/Drake’s Rewards or sending relevant material from the Bluegrass Hospitality Group (Malone’s, Drake’s, Harry’s American Bar & Grill, OBC Kitchen, Aqua, and Malone’s Prime Events & Receptions) with updates on your card point total, upcoming events, specials and promotions. The BHG Group will notify its members of the BHG/Drake’s Rewards Card via email and on this website if we make any changes to our BHG/Drake’s Rewards program. Any new information will be posted on the rewards site at least one week prior to its taking effect. The Bluegrass Hospitality Group reserves the right to change or cancel the BHG/Drake’s Rewards Card at any time without reason or notice. Members will be notified through email. Changes will be posted on this website and the Bluegrass Hospitality Group website www.bluegrasshospitality.com. The Bluegrass Hospitality Group reserves the right to audit any BHG/Drake’s Rewards Card account at any time and may terminate membership in the program if fraud is suspected. The Bluegrass Hospitality Group reserves the right to cancel your BHG/Drake’s Rewards Card after 18 months of inactivity. The BHG/Drake’s Rewards Card is neither a credit card nor gift card therefore; no laws, regulations or restrictions that apply to credit cards or gift cards apply to the BHG/Drake’s Rewards Card. One point is applied for each pre-tax, pre-gratuity dollar spent on food and non-alcoholic beverages. 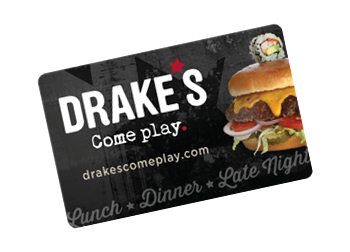 The BHG/Drake’s Rewards card may be used at any of Bluegrass Hospitality Group restaurants, including carryout. Our family of restaurants include Malone’s, Drake’s, Harry’s American Bar & Grill, OBC Kitchen, Aqua, and Malone’s Prime Events & Receptions. The BHG/Drake’s Rewards Card will take effect on day of issuance, or when the card is received in the mail. Prior purchases do not apply. The cardholder must be 21 years of age. By registering for a BHG/ Drake’s Rewards Card you agree to receive weekly email communication regarding your account, upcoming events, promotions and special offers to BHG/Drake’s Rewards Card members only. A special gift will be sent to your email address to celebrate your birthday and wedding anniversary. Upon request of a replacement card, transference of existing points will occur within 10 business days. The BHG/Drake’s Rewards Card must be present at the time of payment to record your purchase. A cell phone number listed in your account may be used to input points. If both are unavailable, please retain your receipt and visit our “Add Missing Points” page and input your information. The application of missing points will take place upon our validation. Only the individual or spouse registered for the BHG/Drake’s Rewards Card will be entitled to receive points. Points and Rewards are non-transferable. Points can be earned on credit card or cash payments only. Points are not issued for transactions paid with gift cards, coupons or Concierge Club dollars. Gift certificates can be purchased with points at redeem.mybhgrewards.com. To redeem your points visit redeem.mybhgrewards.com. Points and Rewards may not be exchanged for cash. If your membership card has been stolen (or your membership number is known to others) call us immediately at (859) 335-6500. We are unable to guarantee a transfer if your Rewards balance has been used prior to the card being reported stolen. Bluegrass Hospitality Group employees are not eligible to participate. BHG Rewards members that settle a check “on account’” are subject to have their points removed if their bill is not paid within 30 days.